Bracknell Town Football Club was formed in 1896 as Old Bracknell Wanderers and changed its name to Bracknell F.C. in 1949. The club played in the local leagues until joining the Great Western league. After four seasons in this league and renaming the club Bracknell Town in 1962 the club was elected to the Surrey Senior League, which they won in the the 1969/70 season. The club also won the league cup in 1968/69 and 1969/70. After this success the club entered the Spartan League (later re-named the London Spartan League) and finished runners up on goal average in 1975/76, in which they also reach the fifth round of the FA Vase. After winning the league in 1982/83, they were promoted in 1984 to the Isthmian League Division Two South. They were promoted to Division One as runners-up in 1985/86, finishing third in their highest ever league placing. However in 1988/89, Bracknell Town were relegated and following a re-organisation of the Isthmian League were placed in Division Three in 19991/92. They returned to Division Two after wining the league in 1993/94, but after five seasons were relegated back down to Division Three. Further league re-organisation in 2002/03 the club was moved into the Isthmian League Division Two South, but moved to the Southern Football League Division One West after two season. Bracknell were reprieved from relegation in 2008/09 but were relegated the following season to the Hellenic League Premier Division. The downward trend continued and after just two seasons Hellenic League Premier Division they were relegated to Hellenic League Division One East. The Club returned to the Premier Division after just one season in Division One and although flirting with relegation recovered to finish just below halfway. 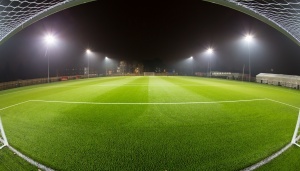 At the start of the 2016/17 season under the guidance of new chairman Kayne Steinborn-Busse the club embarked on a major re-development of the ground with the installation of a state-of-the-art 3G pitch, changing facilities and club house and in keeping with this total modernisation re-branded the clubs logo. The reaped major benefits from this work with all teams down to the youngest age group now able to play and train at Larges Lane. For the senior club, the reserve team returned to the Suburban League whilst the First team had their most successful season for a very long time. Under the management of Mark Tallentire, we were involved in the Hellenic Premier Division title and promotion back to the Southern League , which went down to the final day. Unfortunately we lost on the day and finished runners-up, however the disappointment was tempered by winning three cups, the Berks and Bucks Senior Trophy, the Hellenic League Challenge Cup and the Reading Senior Cup where the final was played at Reading FC’s Madejeski stadium. Bracknell Town FC is an FA Charter Standard Community Club providing a high-quality football experience for anyone involved with the club. We provide top quality coaches to both boys and girls aged 6 and above. Our new facilities including the latest 3G pitch will allow Bracknell Town to offer the highest standard of grassroots football to the local community.